1) Consent: If you plan to take any photos or videos of any individual at the DFC, you must get their permission. 2) If pictures are taken of others, please share. 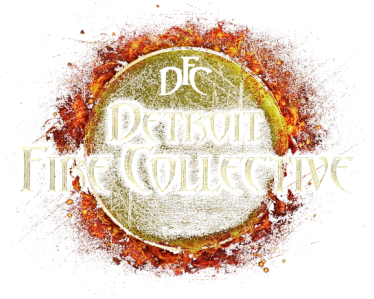 3) Give proper attribution to the Detroit Fire Collective. 4) Participant in the image has the right to request a photo be removed from social media and any point in time. 1) All general photography guidelines apply. 2) Please see the Film and Photography Release Policy for more detail. 3) If first time attending, PRIOR approval of DFC administration (via ﻿Detroitfirecollective@gmail.com﻿) is required before shooting. a. Photographer will be required to sign the Photography Release Policy. b. A photo credential (lanyard) will be given and should be worn and visible at all times when shooting. c. Once credential is given, photographer accepts responsibility of holding onto the credential and bringing it to event where they choose to photograph. 5) If possible, once initially approved announce to the group via the FB that you will be indenting to shoot on a specific date. Same day is fine. 6) Try to introduce yourself to attendees on site and give them a way to contact you. 7) Pictures should be shared to individuals in the images either privately or via the DFC Facebook Group Page in a timely manner. 9) Photo license to DFC and its attendees is provided at no charge. 10) Commercial uses require DFC pre-approval. 11) DFC photo subjects will be granted limited license for personal and personal promotion use of original non-watermarked DFC images by request if the photo subject is in the photo. Although watermarked photos are the preferred usage by the DFC and photographers for general social media usage, photo subject will make every effort to provide photo credit when original non-watermarked images are used. 12) Usage of watermarked images do not require multi-level approval. 13) No imaging of minors should be taken without parental approval.